Dannon plant makes yogurt "green"
Manufacturing • New facility uses bacteria to fight waste in its water. 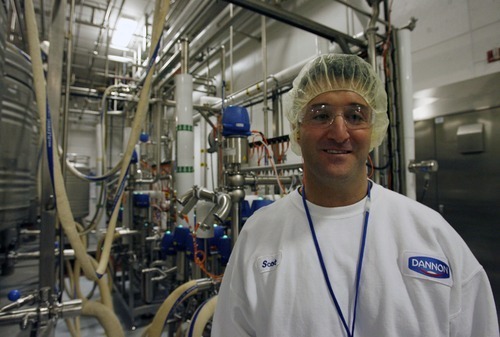 Steve Griffin | The Salt Lake Tribune Scott Corsetti is the plant manager at the Dannon yogurt plant in West Jordan. The plant operates around the clock producing several kinds of yogurt. Dannon's West Jordan production plant was running into trouble with its waste water, so the company turned to a science it knows well: "live and active cultures." The plant recently installed a new treatment facility, called a biodigester, which uses bacteria to lower the pH of its waste water, which contains dairy byproducts. Although the system uses different bacteria than found in yogurt, the principle is the same, said Dannon spokesman Michael Neuwirth. "It harnesses the power of nature to render the water cleaner," Neuwirth said. "We're awed by the power" of simple microorganisms. The water and dairy waste mixture enters the biodigester, where the milk products provide food for the bacteria. The tank is a closed, covered system which must be sampled often to maintain the delicate balance between bacteria and food. The plant has been manufacturing yogurt in West Jordan since 2001, but began a 20 percent expansion project about two years ago. The plant now churns out 2 million cups of yogurt per day, but the growth was a bit more than the old water treatment facility could handle. "They kind of outgrew their ability to pre-treat," said John Newman, general manager of the South Valley Water Reclamation Facility. Many manufacturers must treat their waste before it goes to the reclamation center, Newman explained, and all the dairy products in Dannon's water were raising the pH so much it couldn't be properly treated. The reclamation facility contacted Dannon about the problem last fall, and was pleasantly surprised by Dannon's rapid response. The new facility was open and operating the last week of March, just as the required legal notice was printed in local newspapers. "Seldom do you have somebody as supportive as Dannon was," Newman said. The system is a long-term investment for Dannon worth hundreds of thousands of dollars, Neuwirth said, though he declined to give an exact amount, adding that the facility should help with some of the strange odors generated by the plant. "We believe in terms of sustainable development," Neuwirth said, "for environmental purposes as well as community relations."